A small presentation about how a Gmail message travels when you click Send button. It is part of Google’s advertisement campaign on its green initiative. Google has recently released a simple audio/video presentation to let Gmail users know how an email travels to its destination once you’ve clicked the Send button. Intuitively, the presentation has been named as the “Story of Send”. Many people wonder how exactly email works –many wonders about how it travels –many others wonder a lot about Google’s infrastructure that handles enormous amount of data. This presentation provides you with the answer in a very simplistic layman’s way. The presentation is worth watching as visualized journey of email helps you grasp the concept better. 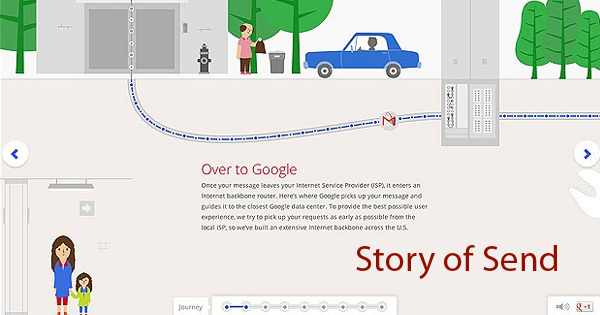 Story of Send shows you how your Gmail message travels. To get a quick glimpse of the presentation you may want to watch the following YouTube video first. Google and other big internet corporations have been criticized for the amount of energy they guzzle in maintaining their data warehouses. Admirably, these companies have taken steps to minimize impact on Earth’s environment. Google is leading the pack by making its data centers environment-friendly. Frantic activities keep taking place around the Internet every second. Email traffic is constitute significant portion of these activities. Therefore maintaining email data center and other related infrastructure requires large amount of energy. Through Story of Send advert, Google is trying to publicize its effort on minimizing its carbon footprint.